This webpage describes the 16 kHz multichannel data used for experiments in the paper with same title, submitted to ICASSP 2005. Pointers to DIVX videos and WAV sound files are included. Note: optimized C code can be accessed here. Seq. #1, #2 and #3: loudspeaker recordings (emitted signals and recorded signals) can be accessed here (WAV files). Seq. #4: this single human speaker sequence can be accessed here, including a DIVX file and a WAV file. In the loudspeaker case (Seq. #1, #2 and #3), precise speech/silence ground-truth (GT) segmentations and true 3D locations are known by construction. In the human case (Seq. #4 and #5), speech/silence GT segmentations were provided by a human listener. We took particular care not to miss any speech in the GT segmentation, therefore GT speech segments often include silences - e.g. a pause between two words. 3D location truth was provided with a 3D error (1.2 cm) negligible compared to the mouth size, from calibrated sameras . Real recordings were made in an instrumented meeting room  with a horizontal circular 8-mic array (10 cm radius) set on a table. The data is part of AV16.3, a larger corpus available online . Each source was annotated in terms of both spatial location and speech/silence segmentation. In this paper, given the microphone array's geometry, source location is defined in terms of azimuth. Time frames are 32 ms long, with 16 ms overlap. We used 5 recordings from the AV16.3 corpus . In all cases, a circular, 8-microphone array with radius 10 cm was used. Seq. #1 (20 minutes): it is named "synthmultisource-setup1" in the AV16.3 corpus . 3 loudspeakers at equal distance (0.8 m) of the microphone array were recorded playing 20 minutes of synthetic speech with equal power, as an alternation of 4 seconds of stationary vowel sound followed by 2 seconds of silence. In each sequence, all 200 possible combinations of 2 and 3 active loudspeakers and 5 different vowels are played sequentially. Vowels are synthesized using a LPC vocoder and constant LPC coefficients, estimated from real speech. 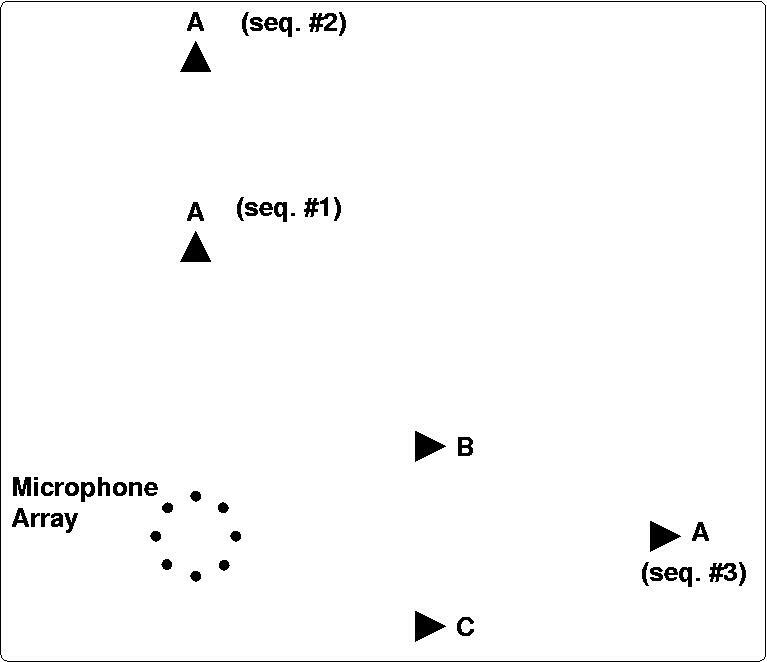 Figure 1 below shows the setup of the three loudspeakers. Seq. #2 (20 minutes): same as Seq. #1, but loudspeaker A is placed at 1.8~m from the array, to test if the proposed method works with one source being much further than the others. Seq. #3 (20 minutes): same as Seq. #1, but loudspeaker A is placed at 1.45~m from the array, in the middle direction between B and C. This tests whether the proposed approach can deal with a larger distance for A and lower angular separation. Figure 1: Top view of the experimental setup for Seq. #1, #2 and #3: 3 loudspeakers A,B,C. Loudspeaker A lies at 90 degrees relative to the array in Seq. #1 and #2, and at azimuth 0 degree in Seq. #3. Loudspeakers B and C lie respectively at +25.6 degrees and -25.6 degrees in all three sequences. Seq. 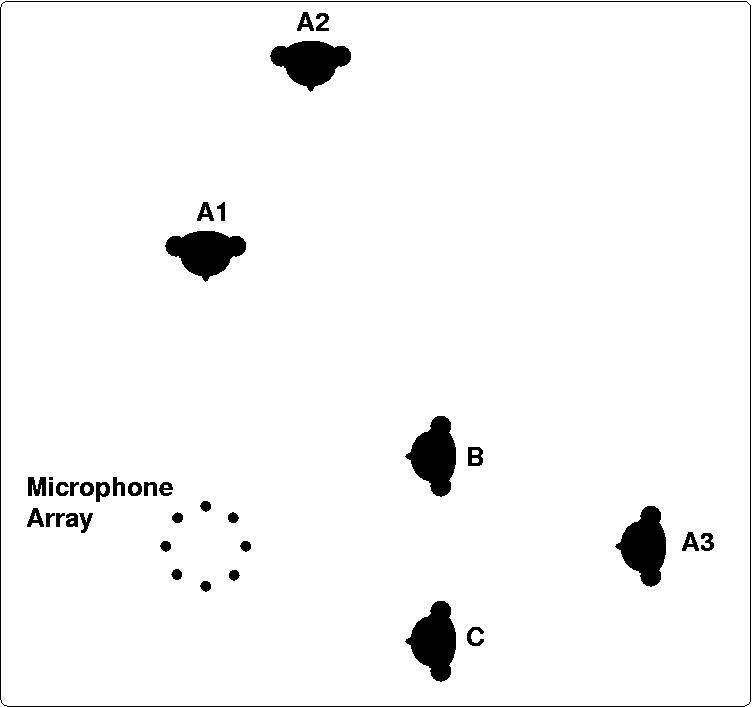 #4 (3 minutes 40 s): A single human speaker is recorded at each of 16 locations, covering an area that includes the five locations depicted in Figure 3 below. Precisely, this area spans 121 degrees of azimuth and radius 0.7 m to 2.36 m, relative to the array. 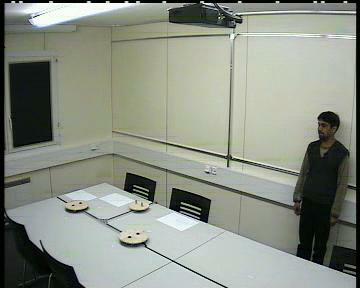 Figure 2: Snapshot of the single speaker recording (Seq. #4), at one of the 16 locations. Seq. #5 (8 minutes 30 s): three human speakers, static while speaking. Speaker A spoke at three different locations A1, A2, A3. Figure 2 below shows the persons' locations. Figure 3: Top view of experimental setup for Seq. #5: three persons A,B,C. Person A speaks successively from 3 different locations A1, A2 and A3. D. Moore, "The IDIAP Smart Meeting Room", IDIAP-COM 02-07, IDIAP, 2002 (ps, pdf). G. Lathoud, J.M. Odobez and D. Gatica-Perez, "AV16.3: An Audio-Visual Corpus for Speaker Localization and Tracking", in Proceedings of the MLMI'04 workshop, 2005 (ps, pdf).